Sometimes the simplest ideas are the best, and also so blindingly impressive that you wonder why it hadn’t been done much earlier. So it is with the National Theatre Live initiative that marks its 10th anniversary this year. 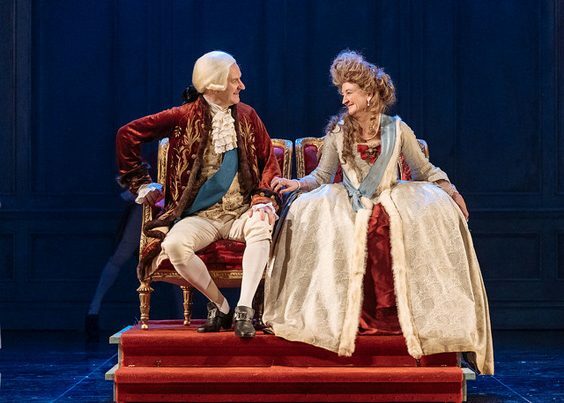 As-live broadcasts of a vast array of productions have since been broadcast around the country, and the latest to receive such treatment is The Madness of George III, which we had the pleasure of viewing at Hull Truck Theatre. This is the first time that NT Live have ventured to the Nottingham Playhouse, where director Adam Penford brought the show at the end of last year, and they could hardly have picked a more outstanding production. Take one of the sublime Alan Bennett’s most well-known plays and add the wonderful talents of Mark Gatiss in the lead role as the eponymous monarch, and it’s hard to go wrong. But this was so much more than just not wrong, it was seriously difficult to fault. Bennett has always managed to have his finger firmly on the pulse way before many of his contemporaries have even started to look for it, and that’s certainly the case with this tale that is now 27 years old. The resurgence of the royal family and a greater, much-needed focus on the issue of mental health in recent years combine to make this look back at a fascinating period in the king’s life all the more relevant in this day and age. While Nigel Hawthorne’s portrayal of George in the original production and subsequent film was one of the highlights of his career, setting the bar high for anyone else wishing to follow in his footsteps, Gatiss is equally mesmerising in the role. In every way he’s the perfect actor to play the king, beginning and ending with a touch of levity and comedy in his performances, sandwiching the period when George’s grasp on reality ebbed away, threatening his place on the throne as well as his very sanity and future existence. Bennett’s blend of wit, farce and sadness shines through always, but Gatiss’s portrayal of a man losing his mind is utterly spellbinding, and almost exhausting to watch, never mind play. Such a tour de force runs the risk of overshadowing everything else happening on the stage, but this is a performance of such class and quality, from the sets and music to the period costumes, that taking it all in is a real treat. As the king reaches his nadir, in desperation his prime minister William Pitt, solemnly played with real impact by Nicholas Bishop, calls in the services of former cleric Dr Willis, whose introduction brings to the stage the wonderfully talented Adrian Scarborough. Scarborough starred in the film adaptation in the role of Fortnum, but here as the no-nonsense and stubborn doctor, challenging the king to recover when all others had lost hope, he provides a brilliant contrast to Gatiss’s theatrics. Throw in a cast that also includes the likes of Debra Gillett, David Hounslow, Andrew Joshi and Louise Jameson, and all of the elements combine to do full justice to the genius that flows from Bennett’s pen. 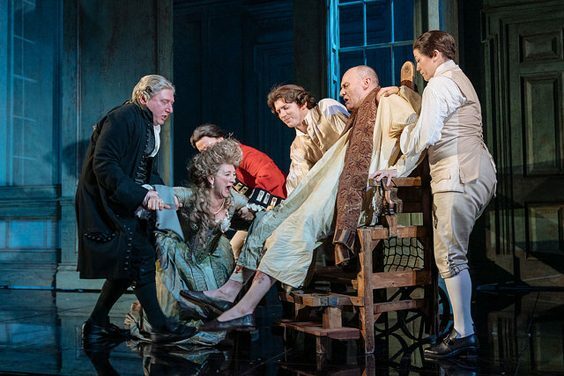 In addition to enjoying a thoroughly wonderful production, should The Madness of George III tour the country at some point, I would simply say – go and see it. And this experience means we’ll certainly be looking out for more National Theatre Live screenings in the future.